On 4 June 2013 the first of the Friends of Africa’s (FOA) summer volunteers set off on an exciting and memorable six week volunteering experience. FOA is a lay group who work in link with the Society of African Missions (SMA). This year we celebrate the 15th anniversary of our foundation. Since 1998, a large number of volunteers have worked on projects in Zambia, South Africa and, more recently, in Tanzania. This year six volunteers and their leader headed to Kitwe, Zambia to work with local people on two projects. It was an amazing opportunity to fully experience “real” Africa. Our picture shows the volunteers and some of the children / teenagers who participated in the different programmes organised during their six weeks trip. It is a eye-opening experience for the volunteers. Hopefully it will have a lasting effect on them which will, in the future, see them become more involved – in different ways – in helping to create a more just world, particularly for Africans in Africa. Since 1999 the FOA have had seventeen long-term volunteers working under the auspices of the Zambian Episcopal Conference. These voluteers normally serve for one year or more. Anita McWilliams from Draperstown, Co. Derry has been in Zambia since last October and will remain until June 2014. The number of short-term volunteers is several dozen. From the start of our stay we were straight into work, which we began in Twafwane SelfHelp Village (pictured) – a project founded by Fr Anthony Kelly SMA and supported by the FOA. There are currently 64 houses, all of which needed painting in order to preserve the bricks and to make sure the rainy season doesn’t damage them. We completed 22 of them during our six weeks. Since we returned to Ireland the painting has been completed by local people with help from Fr Anthony’s brother and three children who came for a period to help. With the painting completed all that remains is to wire the houses for electricity. The residents have either come from poor housing conditions, are widowed, been affected by the HIV/AIDS epidemic or have come through street shelter rehabilitation programs. Anita has established a preschool in Twafwane. While the preschool is very basic – a few walls made of planks of wood – the impact of her work is immense. Along with Sylvia, a local lady, Anita and the volunteers taught basic English and Maths to 40 children (up to 10 years of age). It is so important for the children to learn English as it gives them a head start in school and gives them a better opportunity to complete their education. During our time in Zambia, we learnt that the local Council had given land and permission to build a preschool for the Twafwane village. It was overwhelming to see just how much it meant to the people in the compound. The locals literally sang Anita’s praises for well over an hour to show how much they appreciated the work she had done. It’s an exciting time for the FOA as this will be our first, independent project in Zambia that we will work on. Beside Twafwane there is a Shelter for young boys who have come off the streets. An independent organization, Friends of the Street Children (FSC), run the street shelters, try to place children who have been displaced from their homes for many reasons into safe accommodation. They also provide them with clothes and education until they can be reunited with their families (if possible). We spent most afternoons with the boys in Kwama Shelter playing games, teaching and getting to know them and this was something the group really enjoyed. It was hard to imagine that these young boys, not much younger than us, had suffered so much in their lives. The youngest in the Shelter was only eight years old. FSC also have a girls shelter which takes in young girls from the streets. 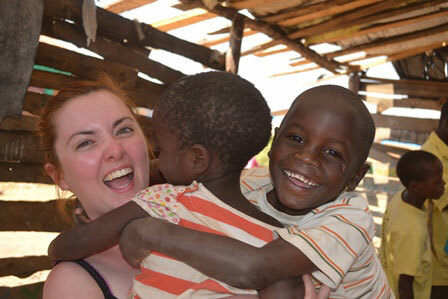 Rachel McDonnell with some new Zambian friends…. The group also had the opportunity to experience the day outreach where they had the opportunity to see where the kids in the shelters lived previously and this really helped to put things into perspective for us all. The boys Shelter also offered a youth club each Thursday for both boys and girls from the area. This allowed them to interact and provided an opportunity to discuss important issues such as HIV/AIDs and gender equality, to name but a few. This is all run under the supervision of Anita and FSC workers and is something the children look forward to each week. While our time in Zambia was short, we took the charity motto – “Small Steps Together” – on board and worked tirelessly, but were aware that we wouldn’t change the world in that short time frame. 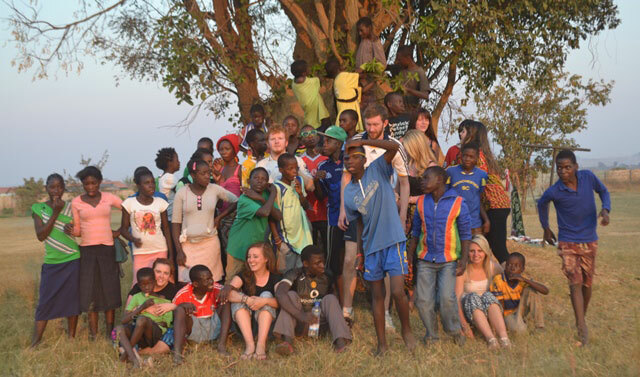 We can only hope that during our time in Zambia we learnt as much from the people there as much as we taught them!